One Week Left To Submit To PopVox: You Could Win A Big Fat Award, And It’s FREE TO SUBMIT! For those of you that have superfantastic projects under your belt and have not yet submitted to Popvox, get on it! It’s free to submit, you could be adorned with the title “International Award-Winning Firm” – wow! – the morale of your award winning team goes shooting through the roof and you crank out even more superfantastic award-winning projects, you win prizes (always fun) and you will be written about on The Bombshell – WOW! Where: SUBMIT HERE – IT’S FREE TO SUBMIT! Find more details and SUBMIT NOW! Submissions close Friday, Sept. 7th. VIDBLOG: The Vancouver International Digital Festival Has A Blog! This year, VIDFEST has been moved from the traditional time slot of mid June, to late September – a strategic move to perhaps free up more summer time for all of those other conferences, and to place the festival leading into the Vancouver International Film Festival, which runs at the end of September and into October. There are some “in-house” writers contributing regularly on VIDBLOG, but every so often you may see a guest appearance by bloggers, technologists and other industry folks, blogging about anything under the sun. Well, within the realm of technology, the internet, gaming – all things digital media, we’ll say. 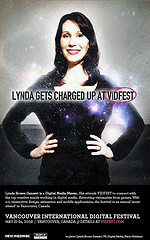 VIDFEST is a world premiere event that is organized by New Media BC every year and sponsored and attended by people in the technology sector from around the world. You can find out what is on the slate for the festival in 2007 on the schedule, and you can also register online (tickets on sale starting in JULY).